Acryla Gouache is an ideal medium available to the artist, designer, illustrator and student. Acryla Gouache has 102 highly pigmented colors, including 10 metallic and 4 luminous finishes, in an acryl resin which will dry to the same smooth mat finish as does the Holbein Designers’ Gouache in gum arabic. Acryla Gouache moves, reacts, blends and feels like traditional gouache, but is effectively waterproof once fully dry. It is rated for light-fastness, adapted to the Munsell color standard for hue, value and chroma and is made from the purest pigments available. 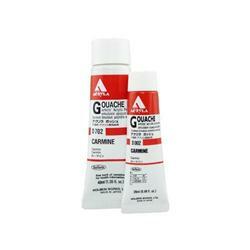 Acryla Gouache may be used as a successful ground that will not contaminate over painted layers. It will not shift in color tone from liquid to dried color. Hence, what you see wet is what you get when dry. Acryla Gouache does not have as fragile a surface as traditional gouache in gum arabic and is compatible with all other water soluble media regardless of origin. An ideal medium for hobbyists and bird carvers as well.